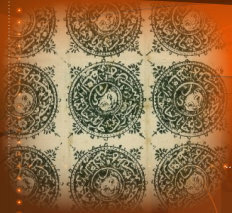 Welcome to a site dedicated to Afghan stamps and postal history. Inevitably the site is going to take some time to grow . . and I've started with some of my favourite areas . . . but I hope that in time will become a comprehensive first stop for all things philatelically Afghan. Pre-stamp mail from Afghanistan is scarce. Afghanistan did not have an organised postal system until 1871. Before that date, mail was carried either by– State Couriers (on behalf of the Amir); Government Couriers (on behalf of high government officials); or Private Messengers. Only one correspondence carried by private messenger is believed to exist. This is a group of twelve letters sent to a religious recluse named Sayyed Ali Abbas by his family. Abbas, who was nicknamed Pir Lal Badshah or “Saint Red King”, had settled at Sultanpur, a village near Dina in Jhelum District, India. His family lived at Lalpura, a village on the Kabul river not far from the Afghan/Indian border. Of the dozen surviving letters, which cover the period 1869 to 1883, only two come from the period before the introduction of the postal system. This example is the second of those two and is dated in manuscript 14th October 1870. The distance from Lalpura to Peshawar, where the letters were put into the Indian postal system, is about 44 miles, but because of the mountainous terrain, the journey by land usually took 3 days, with two overnight stops at Landikotal and Jamrud. This series of covers however covered the distance in either one or two days. The speed indicates that they were carried by raft down the fast flowing Kabul river. Rafts were sometimes made from timber, but usually from buffalo or goat skin. The letter is dated in manuscript 14th October, and has the Peshawar City Receiving House cancel of the same date, a Jhelum mark dated (1)5 (10) 70, and a faint triangular postage due marking. This is also the earliest known example of a Christian date being used on an Afghan cover and is illustrated on page 22 of Uyehara and Dietrich, Afghan Philately. These "stamps" first appeared in 1890 when they were brought back from Afghanistan by a German, Captain Griesbach. He showed them to Thomas Tapling, then vice-president of the Royal Philatelic Society whose collection was later to form the basis of the British Library collection. On analysing the stamps and a few covers Tapling declared that "their history seems satisfactory" and that they were "an unknown and bona fide issue of Afghanistan" apparently pre-dating the first Afghan stamp by 4 years. Two examples remain in the Tapling Collection. Stanley Gibbons included the stamp in their 1891 Catalogue as Afghanistan number 1. Doubts were soon raised about their authenticity. The two foremost experts of the day - Masson and Jones - concluded that they were bogus. The characters were faulty, and the shape irregular indicating an illiterate engraver. All 21 examples examined were identical, indicating a handstamp (like the 1880 issue) rather than a lithograph stamp (like the 1871 issue). The design, paper and ink were also more similar to the 1880 issue than the 1871 issue. Stanley Gibbons eventually deleted the stamp from their catalogue in 1909, inserting instead a warning that it was bogus. This example has been (fraudulently) added to a letter dated 1289 (= 1872-73). A page from Stanley Gibbons 1904 Catalogue showing the bogus 1868 issue as SG no. 1. NB Look at the price !! !